Toyota says it is recalling up to 1.8 million cars across Europe, including about 220,000 in the UK, following an accelerator problem. 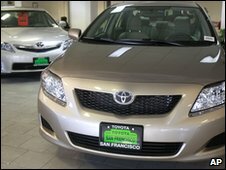 The carmaker says it will recall eight models including the Yaris, the Corolla and the RAV4 sports utility vehicle. On Thursday, Toyota announced it was recalling 1.1 million more cars in the US, a day after suspending sales of eight popular US models. Toyota then widened the recall to Europe and China. Last week it recalled 2.3 million US cars with faulty pedals. In a statement, the company said the precise number of European vehicles involved was still under investigation, "but may reach up to 1.8 million vehicles." The eight models recalled are the AYGO, iQ, Yaris, Auris, Corolla, Verso, Avensis and RAV4 and cover manufacturing dates going back to February 2005. The recall does not affect Lexus models, Toyota said. "We understand that the current situation is creating concerns and we deeply regret it," said Tadashi Arashima, the chief executive of Toyota Motor Europe. Toyota said it was not aware of any accidents resulting from the issue and that only a limited number of incidents involving accelerator pedals had been reported in Europe. On Thursday, Toyota said it was recalling 75,552 RAV4 vehicles in China from 28 February. The cars in question were manufactured between 19 March 2009 and 25 January 2010 in Tianjin, according to a notice on the website of the General Administration of Quality Supervision, Inspection and Quarantine of the People's Republic of China. Separately, Ford said it would be suspending production of a van made and sold in China that has an accelerator pedal made by the same firm at the centre of Toyota's investigations. However, Ford said it had only been using the pedal in the Transit Classic model since December, with only 1,663 vehicles produced.